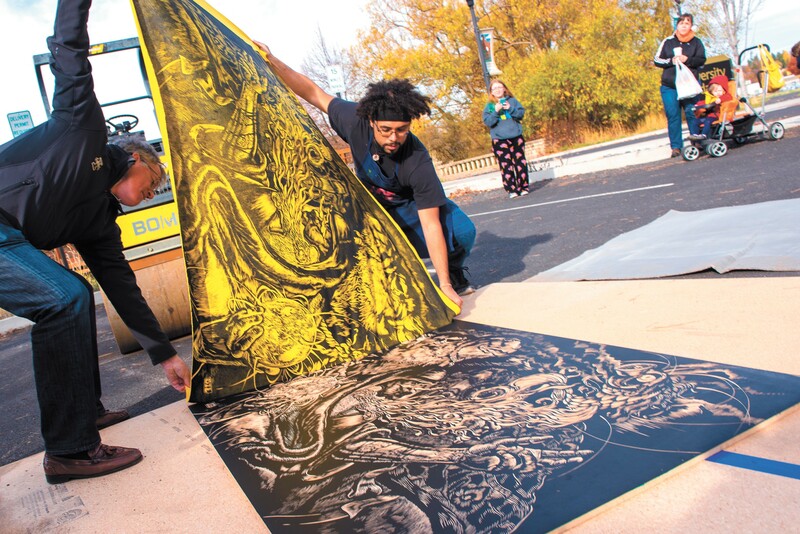 Reinaldo Gil Zambrano, left, an art instructor, created prints using a steamroller last fall. Artists use a lot of unusual tools, but at 44,000 pounds with the maneuverability of a Zamboni, a steamroller is not your run-of-the-mill tool. It is, however, so radical an idea it's got artists at Coeur d'Alene's Emerge artspace buzzing about INK! Print Rally, a one-day interactive festival of printmaking featuring a big yellow steamroller. The event is so monumental, Emerge had to move it outdoors to accommodate the beer garden, live entertainment by DJ Sterling and Tangled Roots, hands-on activities by area printmakers and the much-anticipated steamroller. See, printing can be as easy as painting your hand and pressing it to a surface: make, ink and print the "plate" (in this case, your hand), creating a mirror image (a print) of raised and recessed areas on your hand. Typical printing plates can be carved stone, metal or wood and either pressed along the back or run through a mechanical press to create the print, depending on the plate size. At 4 by 5 feet, however, a different method is needed to ensure that the image prints successfully. For Emerge Executive Director Jeni Hegsted, building a printing festival around the steamroller was a distant notion that, well, steamrolled into possibility through a network of printmakers. Emerge printmaking instructor Hanna Kuhns told Hegsted about the Missoula-based Steamroller Print Project, which commemorates the city's Day of the Dead Parade, marking its 25th year in November. That struck a chord with Hegsted, who has organized Emerge's popular Day of the Dead fundraiser for several years. Millwood Print Works, a new Spokane-based arts nonprofit, offered to help and put Emerge in touch with the University of Montana's Jim Bailey, co-founder of the Steamroller Print Project. Then through the Art Spirit Gallery, Hegsted met Reinaldo Gil Zambrano, an art instructor at the University of Idaho. Gil Zambrano, who was also familiar with the Steamroller Printing Project, organized a similar event at the University of Idaho last October. Gil Zambrano offered to help coordinate steamroll printing at the Print Rally and more printmakers, including Typebee Printshop, have recently joined the Rally, too. "It's an awesome community," says Hegsted. 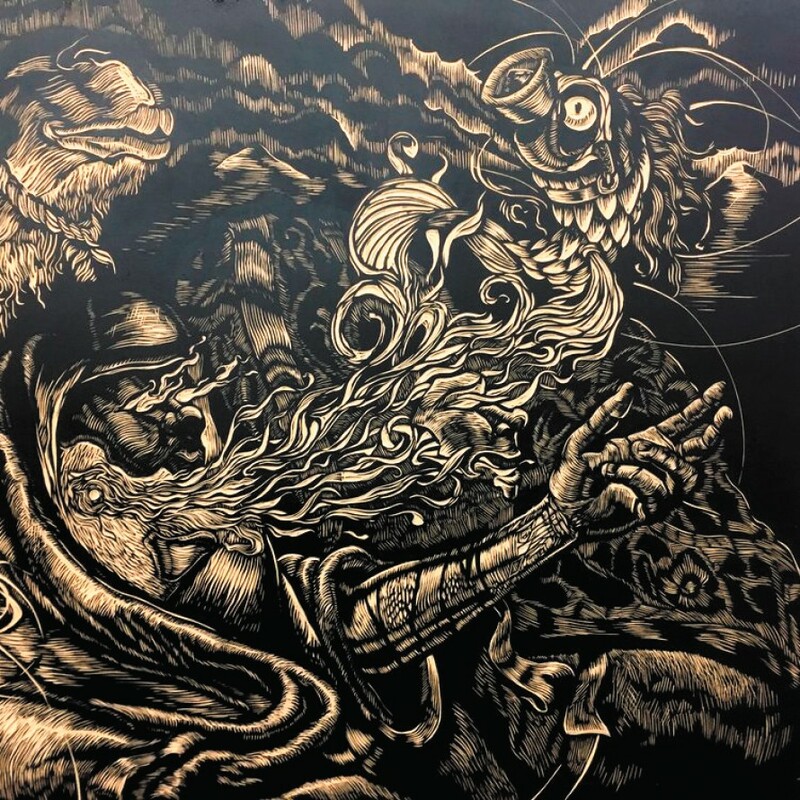 The community aspect of steamroller printing also appeals to Gil Zambrano, who figures it takes two people each to ink the plate, prepare the plate, ready the fabric for printing, and pull the print from the inked plate. Of course, someone has to drive the steamroller, too. Gil Zambrano also likes the immense size of the artworks that steamroll printing can produce: "There is something amazing about large pieces of art, because they have the ability to immerse the viewer." About a dozen artists — including Abby Henning, Alexandra Gnome, Chelsea Cordova, Chelsea Hendrickson, Daren Smith, Emma Johnson, Kelly Burton, Tarin Leach and Tiffany Patterson — have spent the past few weeks carving wooden printing plates in preparation for the Print Rally. Henning, who works at River City Fabrication and typically works in mixed media, was inspired to participate in the steamroller project after taking an Emerge printmaking class. She has spent several weeks carving the flexible MDF (medium-density fiberboard) board to create her image combining a sugar skull, birds and a bird's nest. She's excited to find out how it will look as a print, she says, yet worried the steamroller might crush the printing plate she's worked so hard on.